GM Canada President Steve Carlisle is looking for the "best of the best" engineers and programmers. 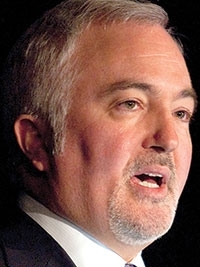 TORONTO -- The automotive industry has not faced as much disruption as it currently does since the days of General Motors of Canada pioneer Col. Sam McLaughlin, and Canada has a chance to play a large role in it, General Motors Canada President Steve Carlisle said today. Electrification, connectivity, automation and the emerging sharing economy are transforming the way automakers do business, Carlisle said at the first Automotive News Canada Congress. He compared the industry as it stands today – with dozens of startups and new companies shaking up the industry – to the days of McLaughlin, who founded McLaughlin Motor Car Co. in 1907 as dozens of new automakers competed for customers. In order to stay ahead of the curve, GM has been partnering with Canadian colleges and universities in order to better utilize their capabilities, he said. “We recognize that Canada has world leading universities, top talent and research areas that happen to be very well aligned with our various needs” in areas such as artificial intelligence, cybersecurity, software development and lightweighting, he said.